Additionally, all photos in this article were taken by Kyoto-based systems biologist Tugi Guenes. 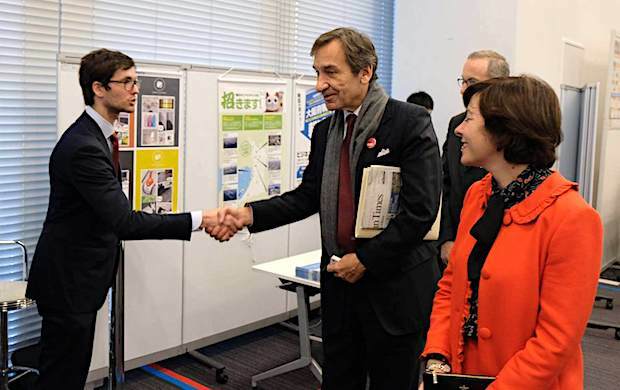 Last week we took part of the closing event of France Japan Innovation year: a special forum when an official mission from France visited Japan to validate bilateral business opportunities. 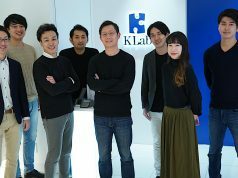 The event happened on December 6th and 7th at Knowledge Capital – Grand Front Osaka (Umeda) , as the outcome of two years of collaboration, when the parts involved had the chance to showcase, all in the same space, their next steps and also new opportunities in innovation between both countries. part of Saijo Inx Sales Team. when Emery highlighted all the close ties between France and KSN. 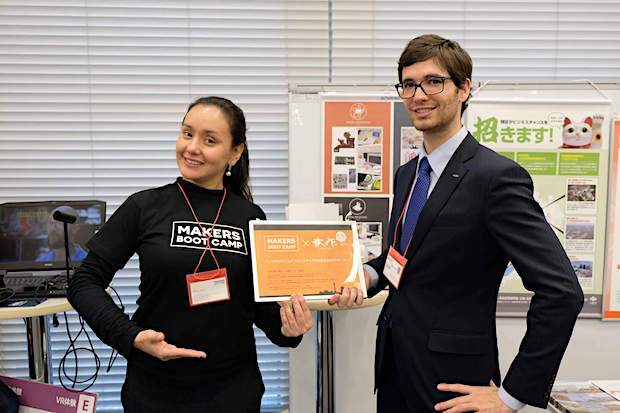 Makers Boot Camp had a booth area together with KSN (Kyoto Shisaku Net), our prototype experts, a network of SMEs who support small lot production for startups creating a new product. KSN has already clients from France, and they also count on some French team members to support French startups. We shared our area side by side with Kyoto VR, a brand new startup working on combining both arts and technology for a unique virtual reality experience. 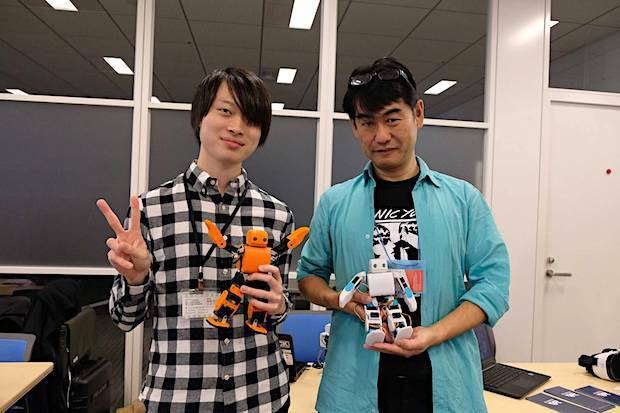 Recently, they exhibited a demo session at Nuit Blanche, a French event in Kyoto, with a special project involving IoT for cultural initiatives. 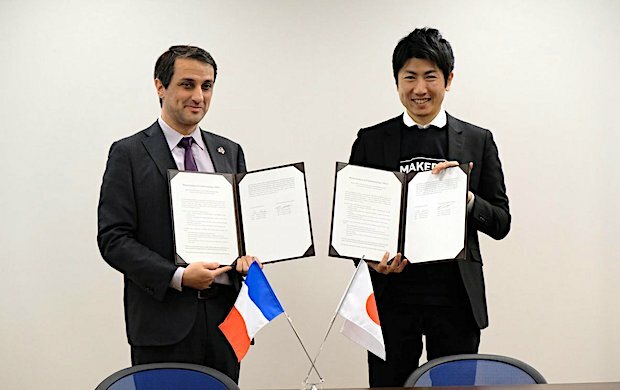 Paris and Kyoto are already sister-cities in the fields of Fine Arts and Architecture and IoT should also be considered for the next projects. Makers Boot Camp team with all the invited startups for the pitch session: Atmoph, PLENGoer and Kyoto VR. 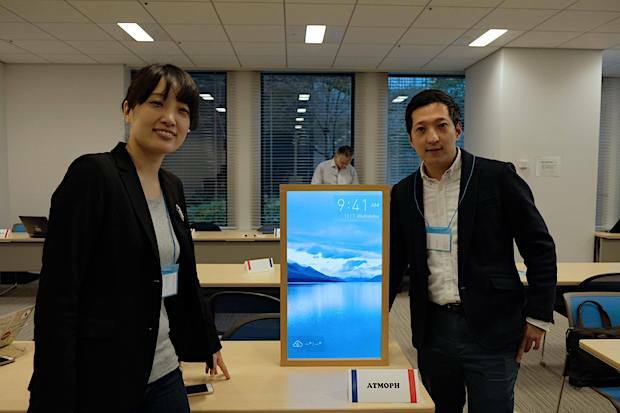 introduced their smart window already available for sale in Paris and other overseas markets. 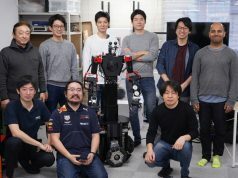 PLENGoer team with their open-source robots that will be in a tour to US for CES 2017. For Japanese makers like them, France is also a key market they plan to expand to. During the two days of the event, there were sessions with key industry players from both countries, as Valeo, Michelin, Orange and Dassault Systems, Toyo Aluminium, SynphaTech Japon, and also a special session day focused on IoT startups. The purpose of the event was to bring stakeholders involved on the current discussions between France and Japan in order to achieve a plan for concrete actions in the next years. 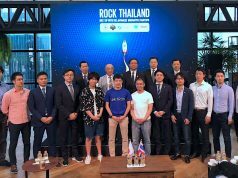 With this spirit, Makers Boot Camp signed an MoU (Memorandum of Understanding) with La French Tech, represented by The French Embassy of Japan. 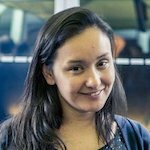 In May 2016, on behalf of Makers Boot Camp, I was invited to attend two outstanding hardware events in France: Connected Conference and Innorobo. It is clear the potential of disruptive projects in robotics and healthcare being created in France, so we’d like to partner with local players interested to reach a global market with high quality. Currently, there are players from both Japan and France willing to promote an exchange of technologies and resources. Aix-Marseille Provence and Occitanie sent their representatives from both private and public sectors. 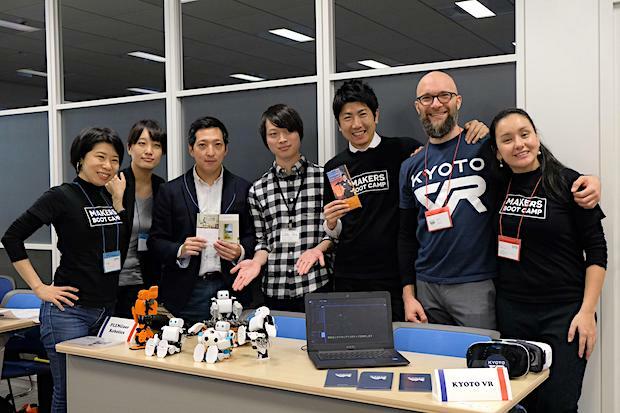 From Toulouse city, Julien Toulouse paid us a visit to our ecosystem in Kyoto, including our KSN factories with French team members involved. 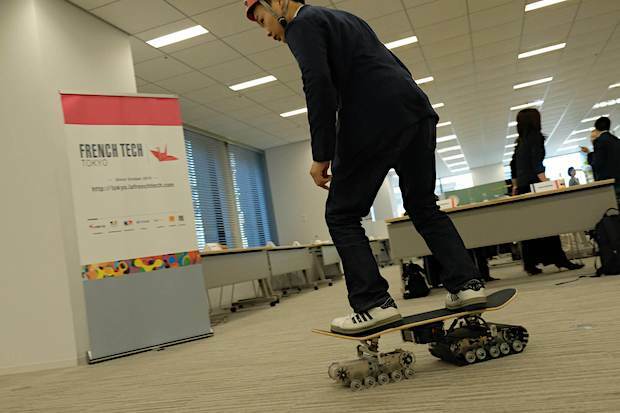 The tour was a way to illustrate Japanese small lot capabilities for French startups. On Japanese side, Kansai representatives from local government and companies were also supporting the event. We hope the players involved can commit to a more active role in both countries, fomenting IoT industry all over the world.